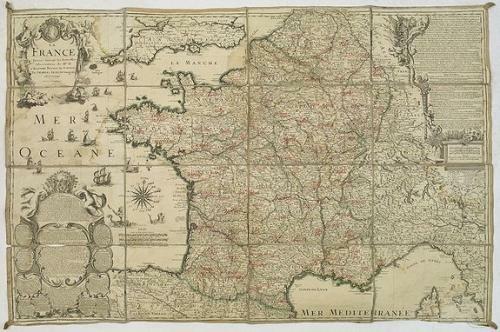 A very rare and large french map of the France with a wealth of detail. Inselin was a prolific engraver and produced maps for several publishers including Nicolas De Fer, cartographer du roi. This map has seen better days: the condition is fair as the map has been backed onto old linen. Some toning, minor repairs and text in an old hand on the map. It is still very impressive and elegant and it is a large map that would frame well.